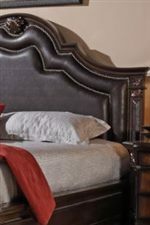 Functionality and opulent traditional fashion combine to create this extraordinary piece of bedroom furniture. The dresser features more than enough storage space for all your clothes, accessories, and lingerie with its ample twelve drawers, all equipped with full-extension glides to maximize the amount you can store and yet still reach easily. 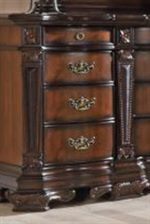 The dresser blossoms with traditional design details like bracket feet with acanthus trim and nailheads on the carved pilasters. You'll keep finding more to love about it as the years go by. The Jade Ornate Traditional Dresser with Twelve Drawers by Lifestyle at Royal Furniture in the Memphis, Nashville, Jackson, Birmingham area. Product availability may vary. Contact us for the most current availability on this product.